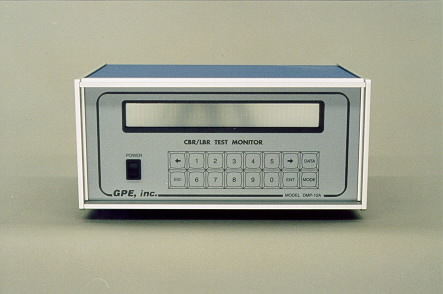 GPE, inc. introduces the CBR/LBR Test Monitor, Model DMP-12A. 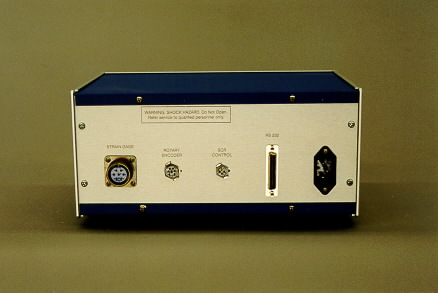 The DMP-12A was developed to supplement CBR/LBR test equipment available from other manufacturers (Rainhart, Gilson, etc.). The DMP-12A provides automated data acquisition, storage, processing and test control. Its microprocessor-based design permits computed, consistent, and accurate CBR & LBR values for every sample. Based on a calibrated system using a 350 ohm balanced bridge strain gage with 3mV/V output. Monitored to a resolution of 0.001"
Excites and monitors balanced bridge strain gages. 16-bit resolution of strain measurements. Computes test standards: CBR and LBR. Stores data for 400 tests. RS232 link to computer to download stored data. Menu driven with a 2 lines of 40 characters display. Maximum strain gage data acquisition of 60 times per second. Equipment available for purchase or lease. Please call or E-mail for prices.